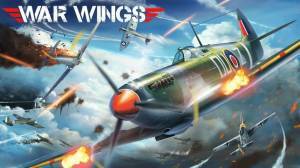 War Wings is a online-only free-to-play World War two aerial combat game for mobile devices that puts you in the cockpit of a customisable warplane. You have the option of either playing in first person cockpit view or a third person full plane view as you fight for aerial supremacy in four-on-four dogfights where the battles are short and teamwork is essential. The content of War Wings includes the main PvP dogfight mode, daily missions and the occasional special events. All of these features will enable you to earn rewards and in-game currency which goes towards upgrading your plane, buying supplies, getting lootboxes, and buying new planes. What Plane should I Pick? What are the different Types of Planes? How do you Track the Enemy? How do you Perform Special Maneuvers? How do you avoid Stalling the Plane? How do you drop Bombs? What are the Weak Points of a Plane? How do you Earn Free Gold? No discussions open for War Wings at the moment.